A good reference for Thailand tourists. Dining, accommodation, shopping and things to do suggestions. When you look at the world map, you may feel that somewhere smiles at you from the east in the middle. This smile is mythical. Do not resist Thai smile for it will take you to the magic land. Dating back 40000 years ago, Thailand is country weaved of history and crowned with pure and dreamy nature. When you see the paradise-like beaches in Pattaya, Koh Samui or Phuket, it will make you think about everything from scratch. The world is a more beautiful place than you can imagine. Thailand boasts never being a colony of western countries among its neighbors. Still, traces of different culture like Indian or Chinese can be felt in each breath in Thailand. The gorgeous and colorful Buddhist temples and modern shopping malls can both be fitted in the same frame in Thailand. Or, traditional wooden houses with a classic pointed roofs will entrance you together with the skyscrapers. 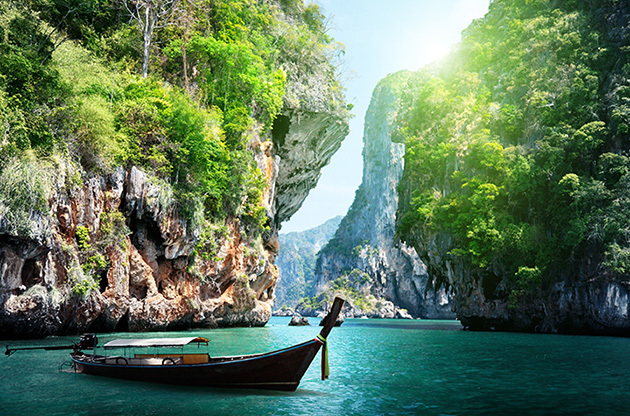 Buy a fruit from the floating market, lie on the virgin sands in Koh Kood, swim with the fishes in Phuket or Pattaya and be charmed by the gorgeous temples. Wherever you go in Thailand, a candid Thai smile will welcome you. To be in the very heart of nature will commonly happen to you in Thailand. Exploring the virgin nature on a huge elephant in a safari park may sound thrilling but we are sure you have never experienced this kind of excitement. You rode a bike, a motorbike, even a horse. Now it is time to ride an elephant and hang on to your hat, swim with them! In Thailand, you may believe that heaven exists, just here, in this world. Your imagination may be limitless but you can be sure that you cannot imagine that white sands and glassy seas under the shadows of palm trees. If you like to live in a dream, you should definitely witness the beauty of Phuket, Koh Kood and Koh Samui with your own eyes. Do not you want to leave the mainland for reaching the heaven? Then go to Pattaya for the same kind of magic. Khao Phing Kan, also known as James Bond Island, the setting of many films is worth paying a visit. Thai massage is not world famous for nothing. When you are in the homeland of this massage, do not leave the country without experiencing it. From head to toe, you will feel you are reborn. You can prefer any premium spa center in Thailand for an excellent massage. If you are curious about traditional Thai lifestyle, Chiang Mai will give you the most about it. The second biggest city of Thailand after Bangkok, Chiang Mai is culturally rich and has much to offer. Once being the center of commerce and diplomacy, Ayutthaya is now a popular tourist attraction in UNESCO’S Heritage List. With the archaeological ruins and enormous Buddhist temples, Ayutthaya will surround you with magic. In Thailand, night bazaars and floating market are highly popular. Fish markets are also attractive as you can see many species of fish in great amounts. Thai Cuisine can be listed among the world’s top ten cuisines. Palm and coconut oil is widely used in almost every dishes. Apart from that seafood is also dominant in this cuisine and you may have the chance to try the fish species that you have never eaten so far. Thai people eat insects. Although it sounds weird for some people, if you like experiencing new tastes, do not hesitate to try. In Thai cuisine, spices are widely used. The balance among the sweet, sour, salty and hot is important for almost each dish. Traces of southern Asia can be tasted in this cuisine. Tropical fruits are everywhere in Thailand. Having delicious and exotic tastes, these fruits or fruit juices will refresh you whenever you feel hot. If tuktuks and taxis stops you in front of a museum and say that the museum is closed. Hesitate to believe in them since they may take you a far destination and charge you a lot of money. Keeping a paper that your hotel's name and address is written on in Thai, will help you a lot since Taxi drivers may not speak fluent English. It will be wise to check whether you need visa to travel to Thailand before your arrival.You can have this information on Thailand MInistry of Foreign Affairs website. Thailand, a standout amongst the countries in Far East, makes a flawless setting for global events because of its multicultural structure, excellent nature and developing economy. Each year, many individuals from each corner of the world come to Thailand for the heading occasions of each fields. Congresses, meetings, fairs, exhibitions and tradeshows attracts numerous people to Thailand and these events might be considered as a big part of the major tourism income pie of the country.